Some peeps on here know this, so don't spoil it for the little 'uns. If you do know it keep cryptic. I think you can still view this today. You'd not expect heckling from Murray in such a quiet spot. That is very cryptic Jogon but I think I may have cracked it but I will leave my answer for now. The drink could be the water that is nearby. Murray will not be Andy, but there is a Scottish connection. Hetchell Crags is some miles away but there is a close sound connection. If I'm right the area today looks nothing like as picturesque as the artist's idyllic interpretation. One of many that does't and never did look anything like the picture that jag painted. The present lot is a fasinating rediscovery and joins other known depictions of the same scene, such as The Seven Arches, Adel, Leeds. 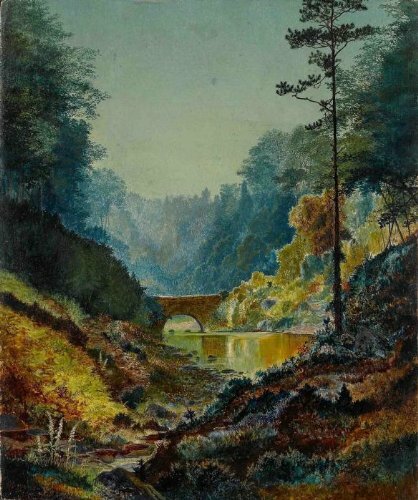 The harmonious affect of Seven Arches, Adel Woods is redolent of the nature-loving depictions associated with Grimshaw?s early years as a professional artist and his growing attachment to the fundamental principles of the Pre-Raphaelites. Adel woods was an area where the newly married artist would often take walks, collecting artefacts and organic material for later study. The largely unspoiled woodland setting became the subject of some of Grimshaw?s earliest landscapes and is represented in the present lot with the intimate reverence for nature that would characterise his entire career. Suffused with a strong attention to detail and a heightened sense of colour, the present lot shows the artist coming to terms with the Pre-Raphaelite style of landscape painting that can be seen with increased confidence in later depictions such as Stepping Stones, Bolton Abbey (186 . "The View of Adel is a very interesting transitional picture where Grimshaw seems interested in building up a surface pattern rather than giving the scene any atmosphere. One might almost compare this to Cotman?s Greta period watercolours. I don?t think I have seen another picture by Grimshaw done in quite the same way. But perhaps it is not surprising that the artist is still experimenting in picture making at this early date in his career." The painting actually looks like the small bridge just before the seven arches, even the span of the arch isn't right, they are very long and shallow unlike the painting. It almost looks like he's painted the small bridge, but left out the arches behind it. I can't find a photo with the small bridge on it, everyone takes photos of the arches themselves. I was wrong in where I thought it was! I thought it was a very artistic interpretation of the footbridge that crosses Adel Beck near Scotland Mill Lane. That is near Bywater Farm, hence my "water that is nearby". My possibly most crypticness was that the Hetchell in Hetchell Crags sounds a bit like hatchel, which is the comb used to separate flax fibres when combing (heckling) the fibres. That it is said to be the Seven Arches I would not have guessed!